A new pilot scheme aims to boost participation in shinty among Scottish secondary school pupils. "Shinty ambassadors" are to be appointed at 12 schools in the project involving the Camanachd Association and backed with National Lottery funding. 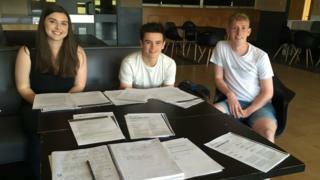 The Camanachd Association's new young persons working group helped to design the new ambassadors programme. Schools taking part include Inverness Royal Academy, Uddingston Grammar in South Lanarkshire and Oban High School. Also involved are Portree High School in Skye, Plockton High School in Wester Ross, Glenurquhart High School in Drumnadrochit and Lochaber High School in Fort William. Ardnamurchan High School, Kingussie High School in Badenoch and Strathspey and Lochgilphead High School and Rothesay Academy in Argyll, along with one other school to be confirmed, will also have ambassadors. Young persons working group member, Emma Gordon, said: "We have really enjoyed being part of the concept and design process and it's great to see our project being brought to life with the funding we have received from the Year of Young People National Lottery Fund. "All of us on the initial working group are still going to be involved in the programme, and will be the main contacts for the young people in the schools who we select to become shinty ambassadors."